Please help to stop the Yulin dog eating festival from taking place this year. This is a barbaric and cruel event which doesn’t warrant the description of a festival. It takes place on June 21st to celebrate the summer solstice but is in reality an excuse for sickening cruelty to helpless animals that has no place in any modern society and should be consigned to history along with all the other inhumane atrocities perpetrated against both human and non human animals down through the ages. Warning very disturbing images, just so heartbreaking. According to this video 4,000 cats are also tortured and murdered in this festival of horror. Please help stop this hideous festival by signing the following petition and taking the actions further down. “Killing innocent dogs to eat them — and torturing them only so they have more flavor — needs to stop!!! “Over 10,000 dogs — many just puppies — were killed at last year’s summer solstice festival in Yulin, China. And it’s going to happen all over again this June, unless people like you speak out to stop the horrific event. One of the most terrifying things about the festival is that it leads to many abductions of household pets by kidnappers looking to make a quick buck as the festival begins. CNN reports that local animal lovers often try to buy the dogs before the butchers can, but the dog sellers often refuse to sell to the activists. The good news is that the Chinese government really is feeling the pressure. According to the Guardian newspaper, the country has started regulating the dog meat trade, and sales dropped by a third from 2013 to 2014. You have their attention on this issue, so another international outcry could very well save thousands of dogs! Please take as many of the actions below as you can, lets help to make this hideously cruel festival a thing of the past. 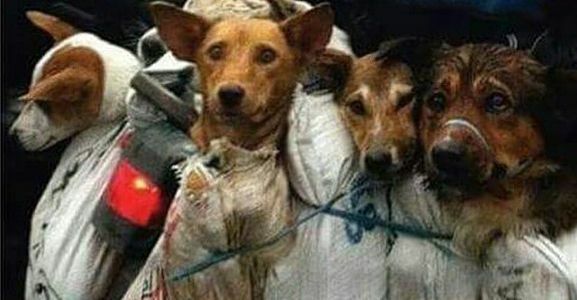 https://www.change.org/p/president-of-the-people-s-republic-of-china-stop-the-yulin-dog-meat-eating-festival – though this has the same information as the care 2 petition it is a different petition and worth signing. Write to the Chinese embassador of your country and politely express your objections and ask for the festival to be stopped. Please don’t write abusive letters or e-mail such is unlikely to be read and may cause more harm than good. Lets not forget that the killing of any animal for meat even if not in such an horrific way is reprehensible, cruel and unnecessary and has to stop. A sheep, a cow or a pig wants to live as much as your cat or dog. All are mammals, all are sentient creatures, all feel pain and suffer as a result of the meat trade, all animals fear death and wish to survive it is one of our most powerful instincts which all animals share. Rather like the Gadhimai festival the Yuling celebration is incongruous with a modern progressive ethical society and has nothing to do with culture, tradition or religion and only began in the 1990s. What are you waiting for? Stop Yulin Festival! Although Darwin was never an animal rights advocate his theory of evolution has profound implications for the way in which we consider our relationship to non human animals and the way we treat them. In The Descent of Man Darwin points out that the “lower animals”, even insects, feel pain, are capable of play, and experience emotions such as pleasure and misery just like human beings. Darwin states the human sense of morality can be traced back to instinctive social behaviour in animals which leads them to feel sympathy for one anothers plight, find pleasure in association with each other and to perform acts of service and kindness and the offering of mutual assistance to their fellow creatures. Along with anecdotes Darwin goes on to cite many examples of the emotions and characteristics of animals that are the same as those in man, such as wonder, curiosity, memory, imagination, reason, the faculty of attention, language and so on. In addition Darwin discusses self-consciousness and mental individuality in animals. It is clear from his writings in The Descent of man that Darwin considered that animals were thinking feeling sentient beings. In his book ‘The Expression of Emotions in Man and Animals’ Darwin again challenges the idea that animals have no conscious thought and act in a machine-like way, as was claimed by some philosophers, such as Descartes. It is obvious that Darwin thought that a lot more was going on in the minds of animals than human beings generally give them credit for and in the aforementioned book Darwin again deals with the parallels between human and non human animals. Even though Charles Darwin was not an advocate for animal rights in the literal sense of the term and was never a vegetarian, he had however much to say concerning our relationship with animals which may have relevance for the way in which animals are treated. I hope that you will sign and share the following petition and as many of the petitions that you will find further down. According to the Center for American Progress, raising the federal minimum wage to just $10.90 would lift 4.5 million Americans out of poverty, benefitting as many as one in five children in the country. As you will see if you scroll down this is certainly not the only petition concerning low pay. Low wages it seems are an endemic facet of our society and one that needs to end now! Whether it is the UK, the USA, or indeed the world over millions are being exploited by low wages. In particular there are many similarities between the USA and the UK concerning low pay. People are having their lives stolen from them as they slave away their precious existence on low wages to make another person rich while they themselves sink further into poverty. Here in the UK workers have just been through the longest period of falling real wages since Queen Victoria. Low pay is endemic in the UK labour market. While the issue has recently moved to the forefront of the public debate on employment and job quality, it is a longstanding feature of the UK economy. More than one in five workers in the UK experience low pay, a proportion that has changed little in more than 25 years. “… after adjusting for inflation, today’s average hourly wage has just about the same purchasing power as it did in 1979, following a long slide in the 1980s and early 1990s and bumpy, inconsistent growth since then. In fact, in real terms the average wage peaked more than 40 years ago: The $4.03-an-hour rate recorded in January 1973 has the same purchasing power as $22.41 would today. “Garment workers should earn a living wage which can sustain a decent life. Low wages destroy lives keeping people in poverty worldwide. Though long overdue finally people are standing up for their rights at least in the USA. Unfortunately here in the UK people seem to offer little resistance to low pay and the misery it entails. Even the unions seem ineffectual. Sometimes we can seem so powerless against the onslaught of greed and exploitation where the rich and powerful can never seem sate their appetite for more and more profit at our expense. Please sign as many of the petitions below as you can. We need to demand a better life for us all, for our children and succeeding generations and demand an end to exploitative low wages for increasingly longer and longer hours. Don’t get confused between a minimum wage and a living wage. They should of course mean the same thing, the basic minimum wage should be the living wage than some, as the introductory quote suggests. More often than not the basic minimum wage is not a living wage. Petitions relating to low pay, minimum wage and living wage. Help to make chocolate fair and get a fair deal for farmers. While not a wages issue in the strictest sense it is a similar type of exploitation. http://makechocolatefair.org/issues/cocoa-prices-and-income-farmers-0 – the petition is right at the top corner of the right side of the webpage. The above is just a drop in the ocean of petitions and campaigns to end low pay to add them all would be overwhelming. It is time for things to change globally and legislation has to bring about such change. More people it seems are under threat of loosing their water supply as the Australian government consider cutting off water and power to 200 communities because the government says it can no longer afford to deliver these essential utilities. Power and water are surely basic requirements in the modern world and should be readily available, particularly in a rich country where there is no excuse whatsoever. Water of course is a vital life-sustaining resource and should never be to denied anyone. Please sign a petition to the Prime Minister of Australia, Tony Abbott, to ask him not to cut off water and power supplies to Aboriginal Communities. The Australian Federal Government is considering cutting off the supplies of water and power of up to 200 indigenous communities, claiming they cannot afford these basic human rights for their indigenous peoples. In 2014, the government announced that they may cease paying for the utilities, making the individual states responsible for supplying their communities with their basic needs. However, the Western Australia government has already stated that they cannot afford to cover these costs, one of the states where many Aboriginal communities live, as well as the Northern Territory. As with Baltimore and Detroit it is once again the disadvantaged who suffer, in this case it is Australia’s Aboriginal Communities, 150 of which are threatened with closure. Another financial decision that seriously destroys people’s lives. Australia like the USA and the UK is a rich nation, it is in fact one of the richest countries in the world, the funds are there it is just that they are not allocated where they are needed but left in the hands of the rich. Australia has 4 per cent of the world’s US dollar millionaires, with 1,252,000 people falling into this category. Why should people go without water and power while others have way way more than they need or will ever need. If you don’t live in Australia this may all sound very complicated and that’s the problem people suffer as a consequence of complex, idiotic and unfair legislation particularly the poor and indigenous populations of countries such as Australia. It is a grave social injustice to deliberately cut of water and power supplies to anyone for any reason, there can never be any justification for doing so. New funding laws threaten the existence of remote indigenous communities already facing profound social issues. “The NHS has been reduced to such a state that, if things don’t change, it could be about to get a whole lot worse. “The extreme Tory spending plans will see social care further stripped out, pushing hospitals to breaking point. “After five years of a government which pledged to protect the NHS, this election campaign makes it timely to assess its stewardship, since 2010, of England’s most precious institution. Our verdict, as doctors working in and for the NHS, is that history will judge that this administration’s record is characterised by broken promises, reductions in necessary funding, and destructive legislation, which leaves health services weaker, more fragmented, and less able to perform their vital role than at any time in the NHS’s history. Please continue reading the complete letter if you have not already done so. “Desperate” Tory plot to organise own letter from doctors exposed in bomb shell leaked email. “Jeremy Hunt has been left red-faced tonight as a bombshell leaked email exposes a “desperate” Tory plot to organise their own letter from doctors. DAVID Cameron’s “ideological prescription” for cuts and privatisation could kill off the NHS within five years, shadow health secretary Andy Burnham warns today. Writing exclusively for the Morning Star, Mr Burnham insists it is “no exaggeration” to say the future of the NHS as a public service is at risk if the Tory Prime Minister stays in office. 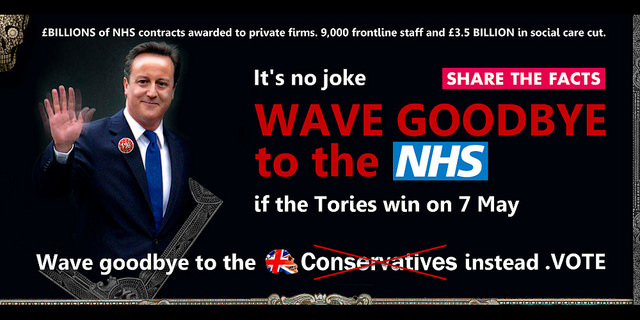 Well I could go on the evidence is overwhelming, five more years of Tory government will see an end to the NHS. If you value our NHS and think that free health care is a human right and should not be privatised DON’T VOTE CONSERVATIVE!!!!!!!!! Help Keep The Water on For Baltimore’s Low-income Residents! Keep the water on for Baltimore’s low-income residents! Water is a human right – especially in the richest country on earth! Yet in the coming days, Baltimore will start cruelly shutting off water to 25,000 households who owe more than $250 in unpaid bills. This is despite the facts that public assistance is minimal, there have been no public hearings, and in many cases, it’s the landlord’s fault – not the tenant’s – that the bills weren’t paid. Even worse, more than one-third of the unpaid water bills in Baltimore belong to just 369 businesses – including $7 million from RG Steel alone – but the city is starting the shutoffs with low-income residents who need water to survive! It seems as though it is the same worldwide, the poorest suffer as a result of the social injustice of a low income while the better off get away with not paying their bills which as the petition says amounts to one-third of all unpaid water bills. 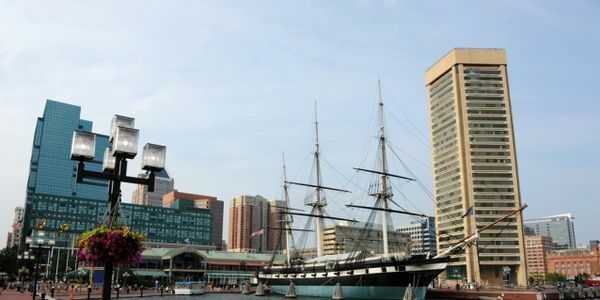 “In what residents warn is a mounting human rights crisis, the city of Baltimore has commenced sending 25,000 notices, the vast majority to city and county residents, threatening to shut off water if delinquent bills are not paid within ten days. Such denial of water a basic human right and vital for survival is becoming more frequent, remember Detroit. Where it looks as though the struggle for this basic life sustaining resource continues. It’s hard to imagine the suffering and misery being without water causes, we take water so for granted don’t we until it is not there anymore. It is more than just having enough to drink. How can you prepare food, bathe, launder your clothes, flush your toilet, clean your home without water. How the hell can you function at all in a modern society to go to work, attend school? It an outrage of injustice when people throughout the world most notably developing countries do not have access to clean water. However to deliberately cut off water supplies were it is readily available is just appalling. To use the word crime to describe such an action would not be inappropriate. I don’t give a damn who supplies the water or how much it cost to do so, water is a vital resource and should not be dependent on whether or not you have the necessary finances. Whether it is Africa, the USA or anywhere else clean water should be provided freely to every man, woman and child, not made into a commodity only available to those who can afford it. Forcing poor people to go without water simply because they do not have the means to pay for it while allowing business who owe one-third of unpaid bills to get away with doing so is not the hall-mark of a just society. As a matter of interest here in the UK if you are a domestic (non-business) customer, water companies can’t, by law, disconnect or restrict your water supply if you owe them money. http://www.adviceguide.org.uk/wales/consumer_w/consumer_water_supply_e/consumer_problems_with_paying_your_water_bill_e/if_you_dont_pay_your_water_bill.htm – but who knows things can change. 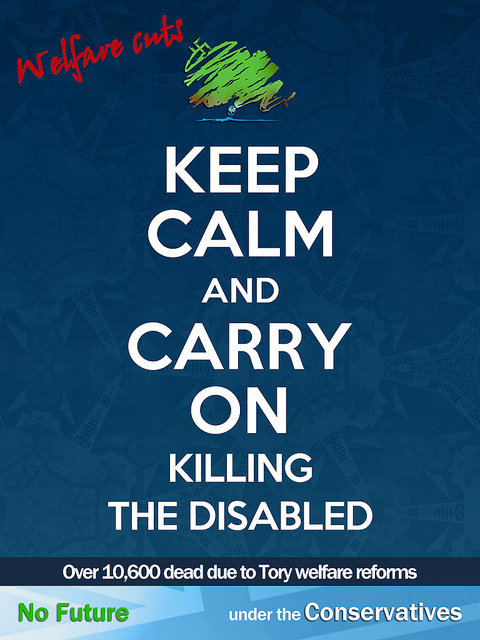 “A parody “Keep Calm and Carry On” themed non-election poster for this parody of a political party and its pathetic and depraved pretense at government. What will life be like for sick and disabled people if the Tories win the election? What cuts to benefits do the Tories propose? The Tories want to cut benefits by 12 billion. “Every stage of your life” that is unless you become sick, disabled or unemployed. Cameron made this claim in his election manifesto speech in which he proclaims his aim is to guarantee a “good life” for British workers and their families. The fact that a 12 billion cut in benefits was included in their election manifesto as an intended vote catcher is truly sickening. I hope that those who would vote for the Tories on the basis of this would think the same way if one day they are sick, disabled or unemployed and need support for the basics of life.No one knows if any of these circumstances may befall them, the fact that people are willing to aid and abet the Tories to strip benefits from vulnerable people who depend on them through no fault of their own and to ultimately destroy our welfare system by voting for them on the basis of this vile committment is disturbing indeed. For claimants, especially those who are sick and disabled, the result of the next election could well have a dramatic effect on the quality of their lives for decades to come. Here is an example of how welfare reforms have affected people with multiple needs. This is an extract from the Voices From the Front Line project’s Interim report , highlighting the damage welfare reforms have caused to people with multiple needs and how the introduction of benefit sanctions has been the most negative aspect of welfare reforms for this group. People with multiple needs experience several problems at the one time which may include the following: mental illnesses, homelessness, drug and alcohol misuse, offending and family breakdown. “We found that recent welfare reforms are having an overwhelmingly negative effect on people with multiple needs. They have led to financial and personal strain, and in some cases placed people at risk.There are particular concerns over the use of sanctions, and cuts to legal aid. Several services perceived an increased risk of suicide amongst their service users as a result. 88% of services reported a negative impact on people’s finances, 82% on access to appropriate housing, and 73% on access to appropriate food and nutrition. Five more years of Tory cuts will turn back the clock to a time many considered long consigned to history, another five years may well see the end to the welfare system. Say no to the destruction of our welfare system, stem the tide of vicious welfare reforms by not voting Tory.